One of the fun things about being a historian who writes about vampires is that I get to plug vampires into history. Obviously, in this particular case, there's one very special vampire I want to plug in. A vampire with a certain set of skills. Enter Amanda Colt, the heroine of my vampire series. Yes, for those people who have read Live and Let Bite, I recall that's not her birth name, but I don't want to confuse people by having two names for the same character. It's even worse, given that she's Russian by birth. She could have up to three or four different names, depending on how the patronymics are utilized. Obviously, some of these are a little vague. In part because I haven't written that part of the biography yet ... and in part because there are some stories I'd like to be able to tell if I ever do come back to this universe. There was an American Expeditionary Force sent into Siberia at the end of World War I. There were a collection of 15 countries (depending on how you want to count them). They were supposedly sent to put down the Communist uprising, but the orders were so muddled, and the support so lax, it looked more like soldiers were sent to get shot at. In this particular case, Amanda helps the AEF out of the area. She is allowed to live, due to services rendered. Also, a box of dirt is brought along. 1920s: She occasionally works with the British Government. Amanda watches the Russian Orthodox Church first suppressed by, and subverted by, Communists. Abandons faith. She tries to explain just how much of a problem the coming Soviet Union is, but everyone believed John Reed's propaganda that "I have seen the future, and it works." Also, she notes this Mein Kampf book, and has a bad feeling about this. 1933: After seeing the rise of this Austrian paper hanger in Germany, she reports the demonic activity and influence she sees in Mein Kampf, AND the vampire activity in Gulags. She is ignored. 1935: After years of Amanda looking at Germany with horror, and getting NOWHERE, Amanda hears of a guy in Lourdes speaking out against the Nazis as dressing up old ideas in new tinsel. He was a Catholic Cardinal name Pacelli. 1937: The Catholic Church officially condemns Communists and fascists the same week. After finding SOMEONE who concurs with her on both of these horrors, Amanda starts the process of becoming a Catholic. 1939: War breaks out. She's generally considered of the Allies, but spends much of her time in the West, going between the Allies, as well as the Vatican. 1941: Operation Barbarossa breaks out. Amanda still doesn't go into the Soviet Union. The vampires for the Germans and Soviets do not go to war with each other, preferring to be camp guards. Nazi vampires go West on occasion. 1939-1945: Puts down multiple operations and experiments of a supernatural nature. 1947: She is recruited by an old acquaintance during the War, Allen Dulles. She knows him less through his OSS days, and more through his nephew Avery, who had joined the Jesuits the year before. She is brought into the newly minted CIA. 1993: Amanda Colt fired due to the "peace dividend" of Bill Clinton. 1993-Honor at Stake.... will be discussed in Good to the Last Drop. 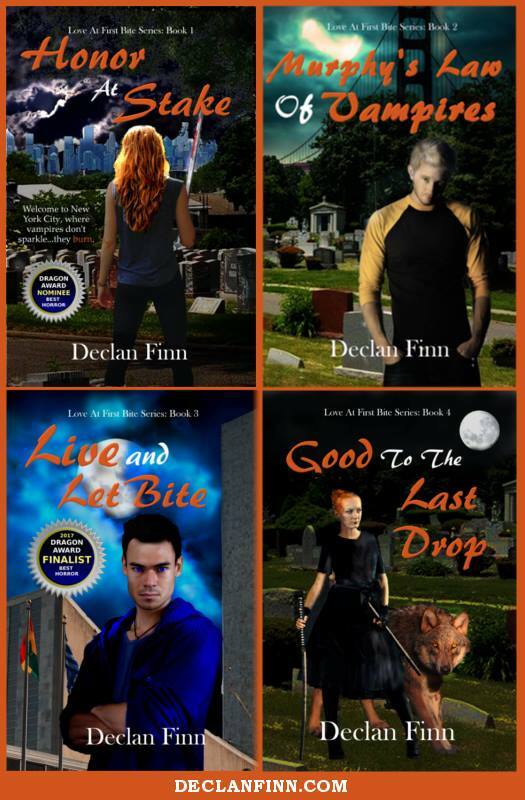 Pre-order Good to the Last Drop, the epic conclusion to the entire Love at First Bite series, and see how the journey ends.